The Crum & Forster building, located at 771 Spring St. in Midtown Atlanta has long been the subject of debate between potential developers who want to use the prime real estate and preservationists intent on saving it. Recently, Tech purchased a property located near the Crum & Forster building that may lead to a resolution to this longstanding dispute. The building is one of the few remaining examples of classically designed architecture in Midtown Atlanta, and as such has been protected for many years by organizations such as the Atlanta Trust and other activist groups. In 2007, the Georgia Tech Foundation purchased the building to expand nearby Technology Square, and subsequently applied in May of 2008 for a Special Administrative Permit to demolish the building. Later that year, Atlanta’s Bureau of Planning denied the Foundation’s request for a demolition permit. In 2009, shortly after the demolition permit request was denied, the building was nominated as a local landmark building. On Aug. 17 of that year, the Atlanta City Council voted unanimously in favor of making the building a landmark, and Mayor Shirley Franklin signed the ordinance into law later that year. The Georgia Tech Foundation, after unsuccessfully appealing the rejection of the permit to demolish the Crum & Forster building purchased the nearby branch of Sun Trust Banks Inc. 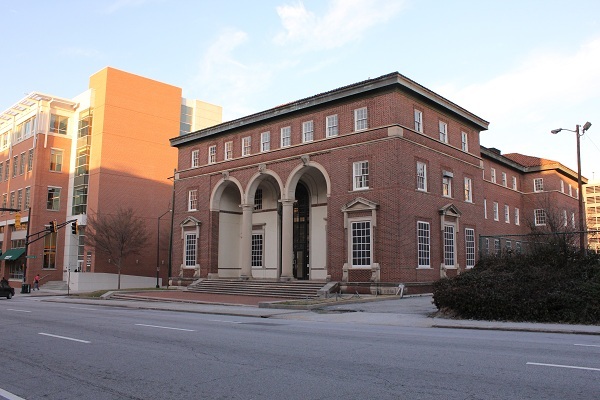 The new property, which will bring the Institute closer to its collaborative research partner, Emory University, was acquired as a result of the relocation of the branch. According to John Carter, president of the Georgia Tech Foundation, Tech continues to become involved with the surrounding Atlanta communities to accommodate the future needs of the Institute for academic, research and related functions and to further contribute to the enhancement of areas surrounding campus. “Now that we purchased the Sun Trust property, we are doing our very best to come to a mutual agreement regarding the future of the Crum & Forster Building,” Carter said. Although Tech’s expansion into the Midtown area has been the subject of controversy in this case, many developers in the Atlanta area are generally supportive of the Institute’s expansion efforts at this time. “Any expansion of Georgia Tech east into Midtown and downtown is a great thing—If you look at Georgia State University, Emory and Tech, they are forming a triangle of development that is a huge boon for our central city,” said A.J. Robinson, president of Central Atlanta Progress. According to Robinson, the prospect of having such highly respected institutions within such close proximity to one another in the Midtown area is one of the greatest strengths of the community.